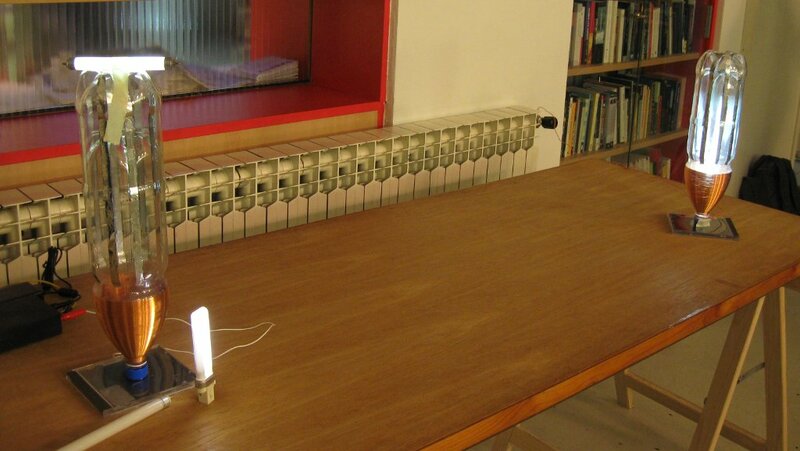 Wireless power is a most wanted technology. It has already been invented by Nikola Tesla in 1888. The speaker read the papers, reproduced the theoretical and practical results. The theoretical idea to get highly efficient wireless power transmission is to separate the electric from the magnetic field, because magnetic field lines are closed curves near the device, while the electric field lines reach to infinity and receiver only needs common ground (the earth). This is done by special requirements to the sender and receiver antennas (form of the coil). The antenna form has been modeled in the software nec2 (variant xnec2c on debian). 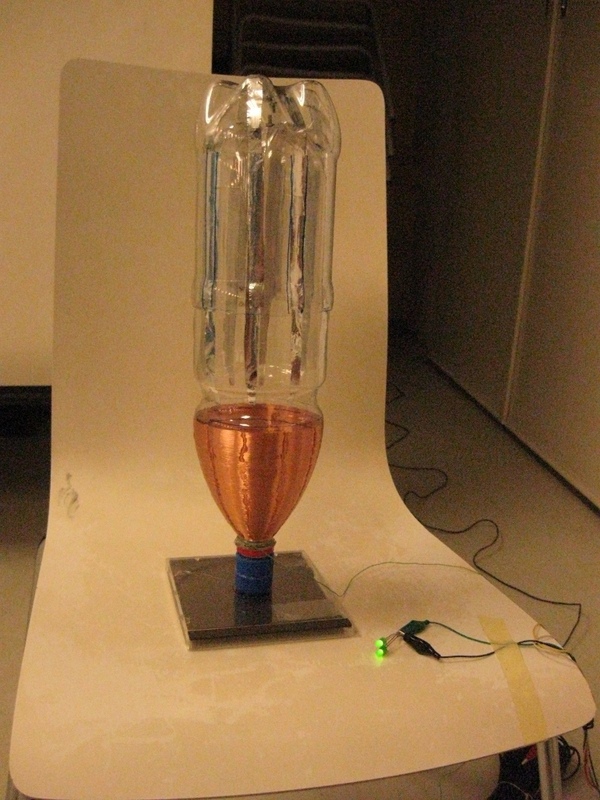 A lowcost PET bottle serves as the hull of the coil. 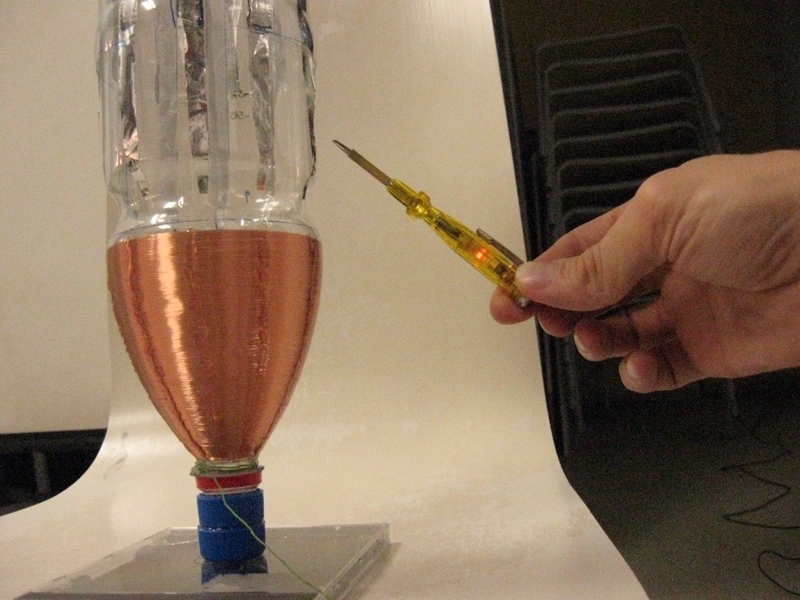 Around 200 windings of insulated copper wire are manually applied to the bottle. A transmission in the range of 10 meters was reached, the power used is 100mW, from signal generator amplitude 10V and 1 MHz frequency. This will be shown. Tesla Long Distance High-Power and High-Efficiency Wireless Energy Transmission is still a mystery to our technology. To better understand his claims that power can be transmitted to any distance on Earth with insignificant losses, and to see what challenges does this pose to the current technology, two simple prototypes of Tesla Magnifier have been built. Understanding of the working principle was needed to build the prototypes with modern materials. All data was readily available on Internet: original Tesla's patents and articles from 1891-1919 related to wireless energy tramission. Information have led to optimal calculation of geometry for a Tesla Magnifier, a kind of resonant antenna used to transmit and/or receiver power. In replicated prototype the oscillatory mode has been determined by measuring phase and magnitude of current and voltage at magnifier's feed line. Some unexpected electrical conditions have been observed which were accurately reproduced using computer models in SPICE (electronic circuit simulation) and NEC2 (antenna simulation and electomagnetic field visualization). Simulation has revealed geometry of the field around the Tesla Magnifier and it differs from the field around ordinary radio antenna (which radiates transversal electromagnetic wave) and could be a clue for faster-than-light energy transfer on planetary scale which Tesla claimed in his patents and articles.